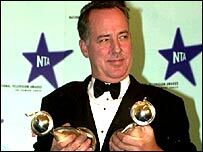 Michael Barrymore has pulled out of his UK stage comeback after just three performances. Minutes before he was due to appear in his stand-up comedy show on Thursday night, he told producers he could not go on. Barrymore apologised to fans, citing "personal reasons" for failing to appear at a London theatre. It was his first UK performance since the death of Stuart Lubbock in his swimming pool two-and-a-half years ago. A coroner had recorded an open verdict, although police found Barrymore to have had no part in Mr Lubbock's death. Barrymore, 51, had hoped to relaunch his career with a scheduled a seven-week run at the Wyndham's theatre in the West End, but ticket sales have reportedly been poor. Despite getting a standing ovation on his first night, he received some bad reviews from critics. In a statement Barrymore said: "Firstly, I would like to take this opportunity to sincerely apologise to everyone who has bought tickets, but the pressure of the last two years has taken its toll. "I would also like to thank my fans, friends and Alcoholics Anonymous who have all helped me remain sober and given me great support and care." Producer Steve Berrick said: "Michael has withdrawn for personal reasons. We completely understand. All monies will be refunded and we wish Michael all the best for the future." 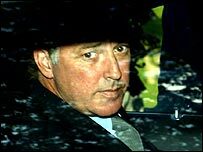 Barrymore's manager, Diana Howie, said he would be taking a holiday but insisted he would not quit showbusiness all together. "He will be back with new stuff, but obviously he needs to have a proper break and recover from the pressures of the last few months," she said. Before his attempted British comeback, Barrymore had performed a live tour in New Zealand and Australia, where he had proved hugely popular. Ms Howie said he had received a number of offers of work from the two countries, and might return there. "He's got interest from all sorts of different fields and it's really a case of doing the right thing for him rather than doing the first thing that is offered," she said. However, before his opening night in London, Barrymore had suggested he might consider quitting showbusiness if the show was a failure. "But I'm not going to crumble down into a heap," he said. "Maybe I'd go to the other side of the camera and try that."